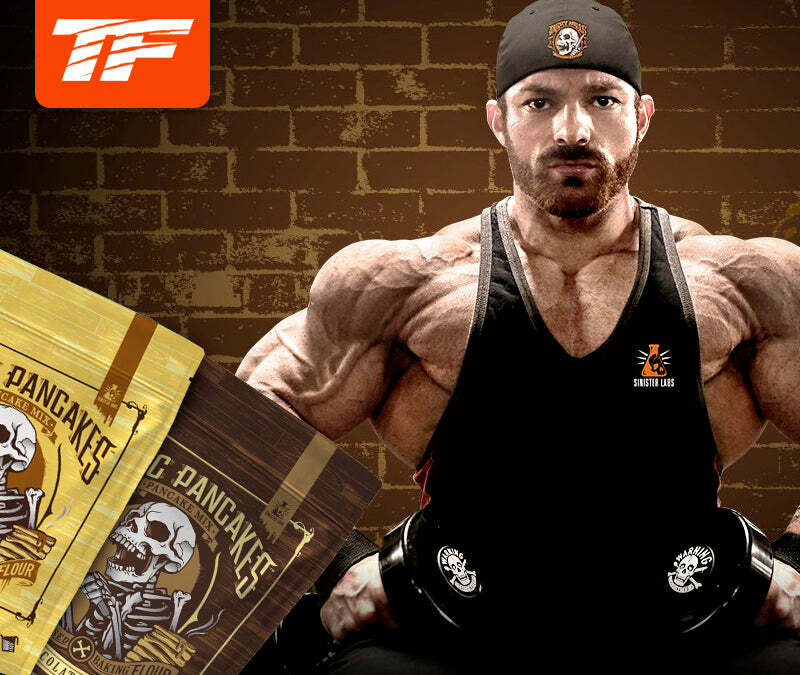 Forget your overpriced grocery store brand protein pancake mix that tastes like complete dirt and pick-up a bag of this delicious flapjack making, muscle building, arm growing, hunger satisfying pancake mix by Sinister Labs. Available in three different flavors, your taste buds will experience nothing but pure joy and happiness with every bite. Baking healthy food shouldn't be hard or taste bad and Sinister Labs Panic Pancake Mix is great for overcoming both of those obstacles. INGREDIENTS:Whole Grain Oat Flour, Buttermilk Powder, Instantized Whey Protein Isoalte, Medium Chain Triglyceride Powder [Medium Chain Triglycerides (from Palm Kernal and Coconut Oils), Sodium Casseinate (A Milk Derivative), Contains 2% or Less of Each of the Following: Silicon Dioxide, Sunflower Lecithin], Organic Agave Inulin, Natural and Artificial Flavor, Double Acting Baking Powder (Sodium Acid Pyrophosphate, Sodium Bicarbonate, Corn Starch, Monocalcium Phosphate), Sodium Bicarbonate, Sodium Chloride, Gum Blend (Cellulose Gum, Xanthan Gum, Carrageenan), Sunflower Lecithin, Monk Fruit Extract. Panic Pancakes: Whisk 1 serving with 1/4 cup cold water until well blended. Let sit for 3 minutes while griddle warms up. Batter will thicken as it sits. Heat griddle to low heart (290F) Cook each side of the pancake for 3-4 minutes or until golden brown. For thinner pancakes: add 1-2 tbsp of water until a desired consistency is reached. For an extra kick of energy and additional protein add a scoop of your favorite Angry Mills Peanut Powder. Then top it off with chocolate chips, fruit, and Angry Mills spreads. Waffle Webs: Wisk 2 servings, 1 egg, and 2/3 cup cold water until well blended. Let sit for 3 minutes while waffle heats up. Cook according to your waffle irons instructions. INGREDIENTS:Whole Grain Oat Flour, Buttermilk Powder, Instantized Whey Protein Isoalte, Medium Chain Triglyceride Powder [Medium Chain Triglycerides (from Palm Kernal and Coconut Oils), Sodium Casseinate (A Milk Derivative), Contains 2% or Less of Each of the Following: Silicon Dioxide, Sunflower Lecithin], Alkalized Cocoa Powder, Organic Agave Inulin, Natural and Artificial Flavor, Double Acting Baking Powder (Sodium Acid Pyrophosphate, Sodium Bicarbonate, Corn Starch, Monocalcium Phosphate), Sodium Bicarbonate, Sodium Chloride, Gum Blend (Cellulose Gum, Xanthan Gum, Carrageenan), Sunflower Lecithin, Monk Fruit Extract.